Click the map to zoom in (and out again). St Nicholas is a small village in the Isle of Thanet, Kent, England, the UK (Google Maps/Bing). 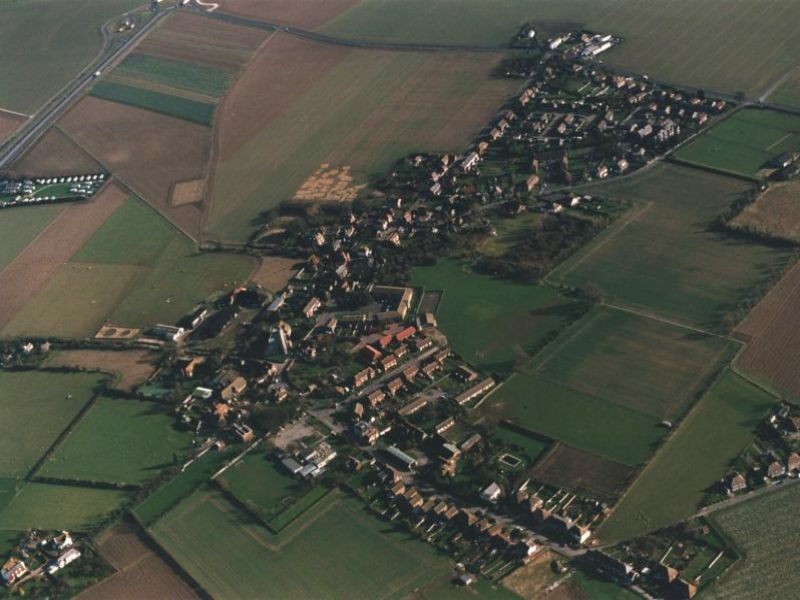 It comprises some 800-odd people (and a few odd people), with one post office/general stores, one primary school, a village hall, a sports pavilion/club, two places of worship (and one ancient underground chapel), and two pubs. The name probably derives from the fact that the church is dedicated to St Nicholas as the patron saint of sailors, and the fact that there used to be a channel one had to cross (although not by "wading" until quite recent times) to get to the mainland. This channel was once over a mile wide, guarded at either side by the Roman forts of Reculver and Richborough, but has now dwindled to two small rivers, the Wantsum/Wansum and the Stour. Some parts of the village still contain the remains of Roman shipbuilding sites. The Norman church dates from the 13th century, and there are remains of earlier buildings too. This site has a simple overview of local fauna/flora. Regular concerts are held in the church (see the News page here, and also Google+ page), and other village events include the biennial Open Gardens (early June), the ancient tradition of Hoodening, and Father Christmas, who comes around in a pony-drawn sleigh on Christmas morning distributing presents. There used to be a torch-lit procession to the sea on Guy Fawkes' Night, but this later switched to a procession inside the village, and more recently to a fireworks display at Bell Meadow. For a few years there was a week of services at the church celebrating Saint Nicolas at around the time of his feast day, December 6. Note on spelling: one sees countless variants online, such as "Saint Nicholas-At-Wade", "St. Nicholas at Wade" and so on, partly due to computerization — even (?) Google, Microsoft, Facebook, and various UK authorities get it wrong. The version above (St Nicholas-at-Wade — no dot after the St, lower case "at", and hyphens as shown) is the version traditionally seen as correct. It's also worth noting that the main thoroughfare is called "The Street" and there are also houses called e.g. Street Cottage, which means computers produce delightful nonsense such as "St Cottage, The St, Saint ..." (occasionally worse: "Cottage St, The Saint,..." — you name it, it's probably been done) Finally, the parish is traditionally styled as "St Nicholas-at-Wade with Sarre".